It’s a bit chilly outside! After a stroll (or in my case a jog) in the crisp air…what’s better than coming home to some nice, warm, home cooked food. Preheat the oven at 200°C/ 392°F. Halve the sweet potatoes and bake for about 50 minutes. While they’re in the oven, wash and prepare the spinach and the mushrooms. Steam the spinach and fry the mushrooms. When the potatoes are done, reduce the oven to 100°C/ 212°F. Scoop the insides of the potatoes out and add the spinach. Crumble the feta cheese over the mixture and spoon it back into the potato skins. Sprinkle some Parmesan over them and replace into the oven for a further 10 minutes. In the meantime roast your pine nuts. 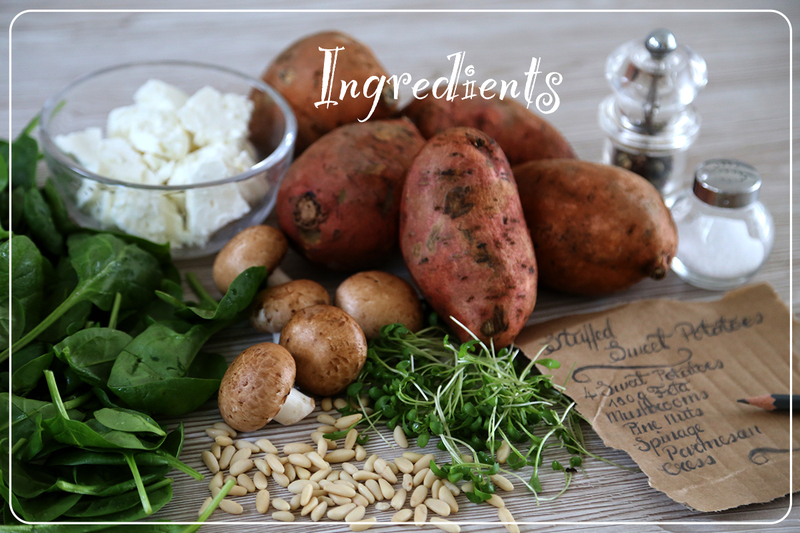 All you need to do now is decorate your potatoes with the nuts and the cress. And there you have it! A perfect warmer upper! Beautiful recipe. Great for a party. Thank you! Perfect for a party (not to much preparation needed 😉). What!!!!! Wow & yum! I almost never see sweet potatoes in a savory setting! You’re my new favorite person! Beautiful recipe and photos! Can’t wait to make these this fall! Dairy free (sadly), but this post gave me some fun ideas for tonight’s dinner. Thanks! found this just in time for potluck planning – looks amazing – will try! Great! Glad you dropped by! Great recipe, love the photos! Can’t wait to try this recipe. Looks yummy! This looks good- how many potatoes? 2 or 3? Nice fonts and photos and overall design of layout. Will try this. Thank you. I used 5 potatoes. Enjoy! Ooo! This sounds delicious. I’ll have to try something similar, maybe with an avocado for me!